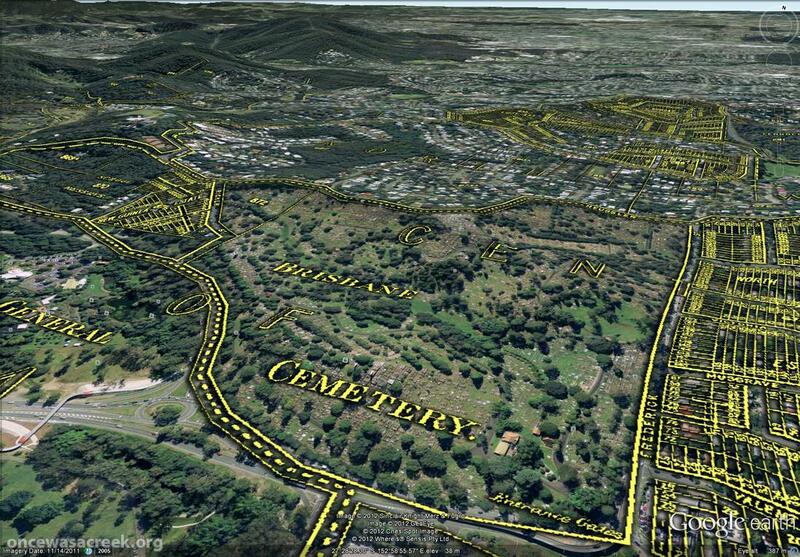 toowong cemetery | There once was a creek . . .
As detailed in last week’s post, I have recently been experimenting with ways of importing historical maps into Google Earth, which enables them to be explored from a whole new perspective. 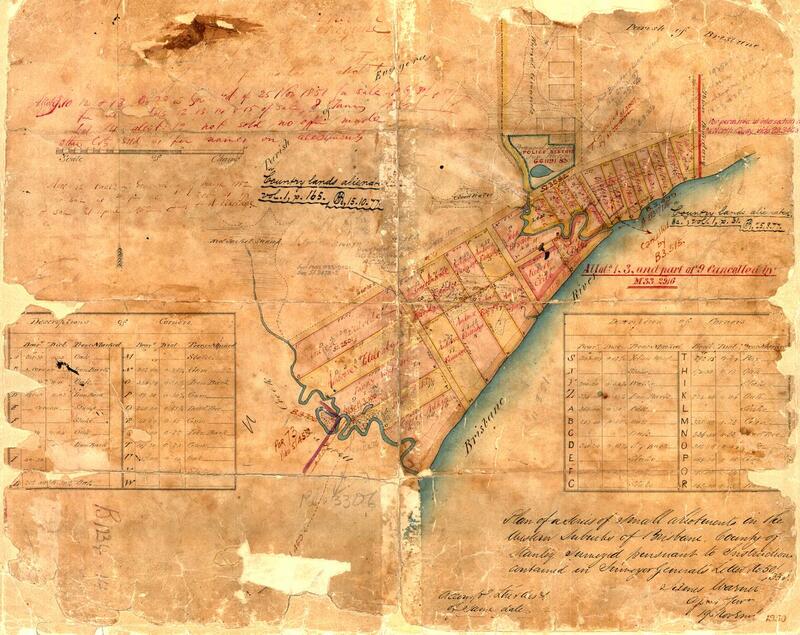 I initially did this for three maps, dating from 1843, 1859 and 1864. Today I’ve done the same for another map — Sheet 7 from a series of maps drawn by the government lithographer A.R. McKellar in 1895. This map shows the Milton Reach of the river and the area to the west up to Mount Coot-tha. You can see what the original version of this map looks like at the Queensland Historical Atlas. 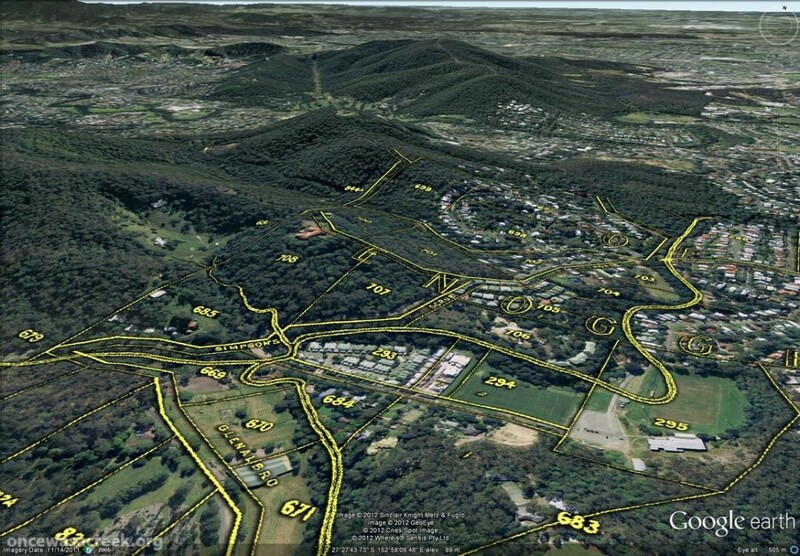 You would already be familiar with this map’s depiction of Western Creek — it is the one shown at the top of this page and all throughout this website. 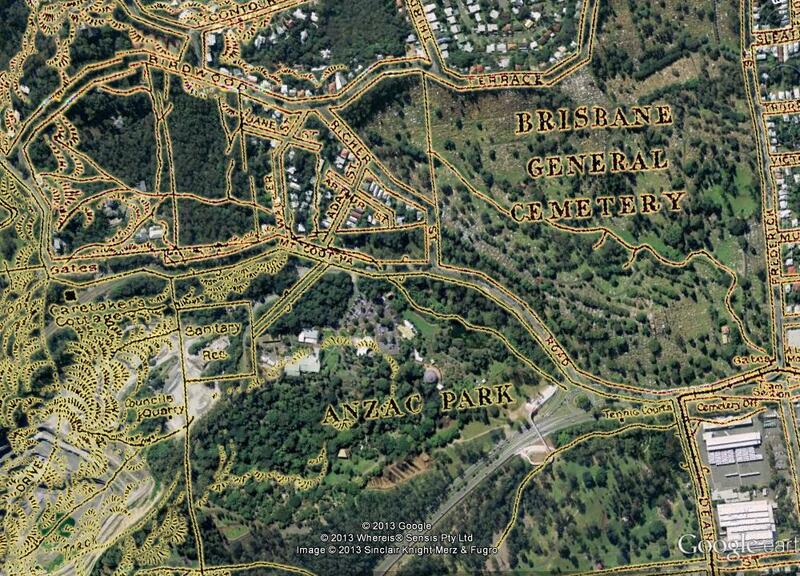 The picture below shows this same part of McKellar’s map in Google Earth. Dunmore Park is in the foreground, and Milton Park, Frew Park and Gregory Park can also be seen along the creek’s path. Western Creek as depicted on McKellar’s 1895 map, viewed in Google Earth. The image below shows the Toowong Cemetery. 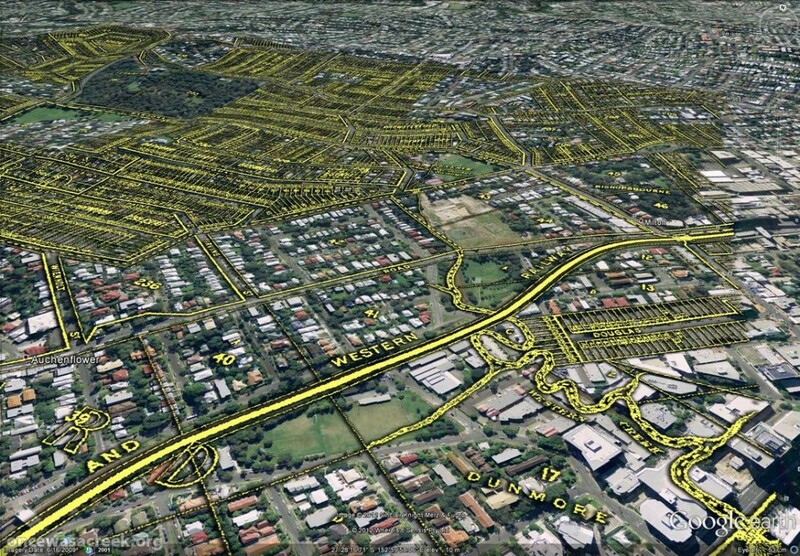 Beyond the cemetery, towards the upper right of the picture, is the area bounded by Boundary Road, Simpsons Road and Macgregor Terrace. This subcatchment of Western Creek is marked on McKeller’s map as the Lizzy Lee, Soudan and Rose Hill estates — names that all seem to have been lost, with the exception of Soudan Street. To the left of the cemetery, a ‘school reserve’ is marked on an area that is still bushland today. 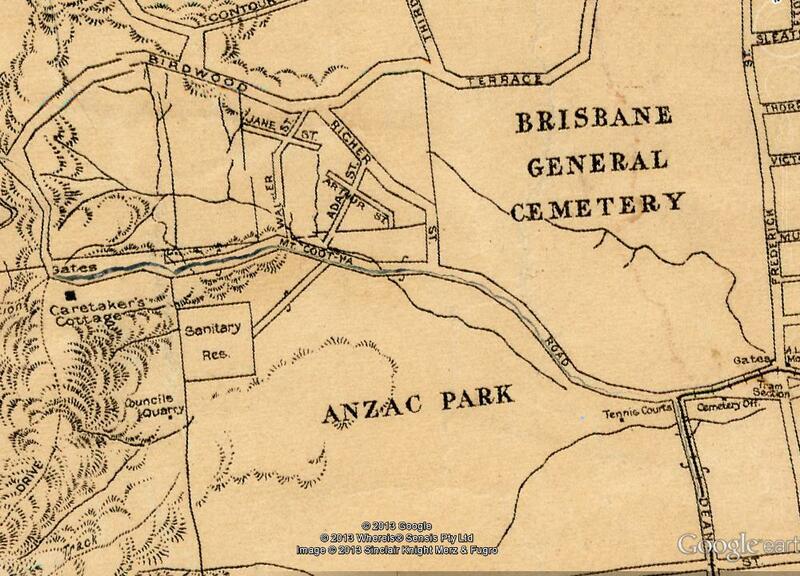 The Toowong Cemetery as depicted on McKellar’s 1895 map. Further in the distance are the Lizzy Lee, Soudan and Rose Hill estates. 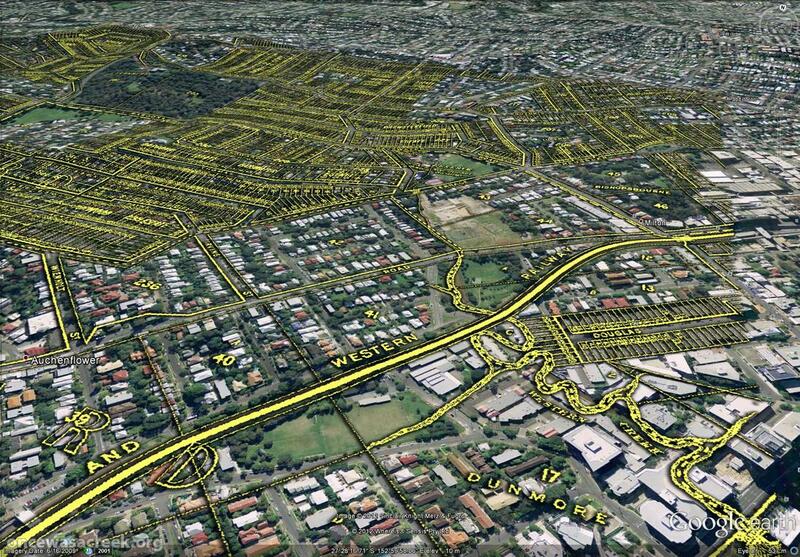 McKellar’s map also depicts part of Ithaca Creek, the catchment of which neighbours the Western Creek catchment. The picture below shows two branches of Ithaca Creek meeting near Carwoola Street. In the immediate foreground, under the name ‘Glenalbro’, you can see the roof of the old Freers chip factory. 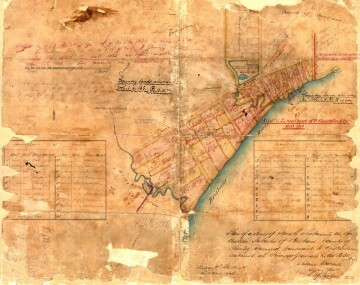 At the lower-right of the picture is Purtell Park, and right on top of it is the creek as it appears in McKellar’s map. I’ve know this spot for all of my life, but I never realised until now that the path of the creek had been changed to make way for the park. Part of Ithaca Creek as depicted on McKellar’s 1895 map. At the lower-right of the picture, the old path of the creek can be seen over Purtell Park. To explore McKellar’s map for yourself, all you need to do is download either of the following files and open it in Google Earth (you will need to download and install Google Earth first if you haven’t already). The first file shows McKellar’s map features in yellow but without any shadow effect. The second file is the same, but includes the shadow effect that you can see in the images above. The first file is much smaller and will load quicker, but some features on the map will not be as easy to see without the shadow.